As UK leaders in kiosk design and manufacturer, Cammax offer an extensive range of support, warranty, installation and service options to match the service and budget objectives unique to your company. To ensure your kiosk is correctly placed with minimum site disruption we offer a complete end- to -end service that includes a comprehensive site survey, delivery and installation. 5- day, 7- day and 24- hour maintenance packages are available and all work is undertaken by our own team of fully qualified engineers to give you complete piece of mind. Read on below to find out more about the range of support services we offer and for more information on customer service and warranties, please visit our kiosk maintenance page. Once your kiosks are ready to be deployed, our team will consult with you to arrange a convenient time and date for delivery. All of our kiosk machines will be delivered in Cammax vehicles and by engineers directly employed by Cammax. All of our engineers are also checked by the Disclosure & Barring Service (formerly CRB). To ensure successful installation we have a dedicated team of specialist engineers on hand to offer practical support and advice. Our highly trained engineers will cover all aspects of installation including; floor bolting, network setup and user training. This end- to- end approach will guarantee your kiosk installation is fault free, whether you’re deploying indoor or outdoor, freestanding, wall-mounted or desk mounted kiosks. Please note, where applicable, Cammax will ensure that all hardware can accept all forms of coinage or notes from the point they become legal tender. For the avoidance of doubt, this obligation relates to the acceptance of all legal tender in circulation and the rejection of currency which is no longer classed as legal tender from the date of withdrawal of legal tender status. Within the latter category of rejecting currency which is no longer legal tender Cammax shall be given a grace period of up to 3 working days prior to the change and 3 working days after the withdrawal of legal tender status to upgrade the whole estate. 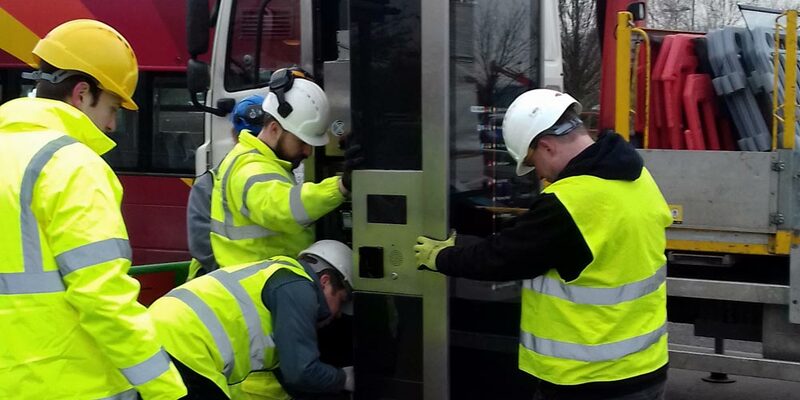 As part of our long-standing commitment to the success of your kiosk project, Cammax offer a yearly preventative visit service to ensure all kiosk components are operating smoothly. Check kiosk heating system is working as expected. Ensure rubber seals around doors are correctly seated. Check touchscreen calibration and re-calibrate if required. Clean interior of kiosk cabinet. Test all main payment components to ensure they are working as expected. Damage caused where the equipment has been used outside of the scope of the operating instructions. Damage caused by any Malicious act or accident caused by any party other than Cammax. Failure of a component or service which is not provided by Cammax. Work required outside those hours, when specifically requested by the client and if the supplier is able to accommodate it, will be subject to an extra charge at our standard rate. For more information, please get in touch to discuss your specific requirements. Estimated Time of Arrival means an approximation of the time of arrival at site. Action Time means the time for the Supplier to advise the client of Capita by Phone or email of the ETA of an engineer to site. Response Time shall mean the elapsed time during the service window between the call being passed or made available to the Supplier by the Client and the time that the engineer arrives on site. Fix shall mean resolving the reported fault by either giving technical guidance to the customer over the phone or the engineer repairing on site. The engineer may replace faulty parts on site or provide a replacement unit and support its installation until working satisfactorily. Any return visit to replace or install parts at a later date would be regarded as a continuation of the call but the response would still be regarded as being within the response time.